Cube-shaped homes are the most common choice for many builders and architects. A home built around the fundamentals of a cube is strong, durable and stable. These qualities extend to shape the way we feel about a home as well. In fact, in psychological terms, the shape of a home has more influence than almost any other element in the design. So what are the possibilities when designing a home built around the fundamentals of a cube? Well, today we'll present 9 contemporary cube-shaped homes. Get ready to be inspired! This home has just a couple of small windows overlooking the street. This has gives the home a lot of privacy. But despite the lack of windows, the home doesn't feel closed off or unwelcoming. This is largely due to the strong, horizontal beam that works to create a welcoming embrace. Note the contrast between the narrowness of this piece and the larger volumes in the facade. 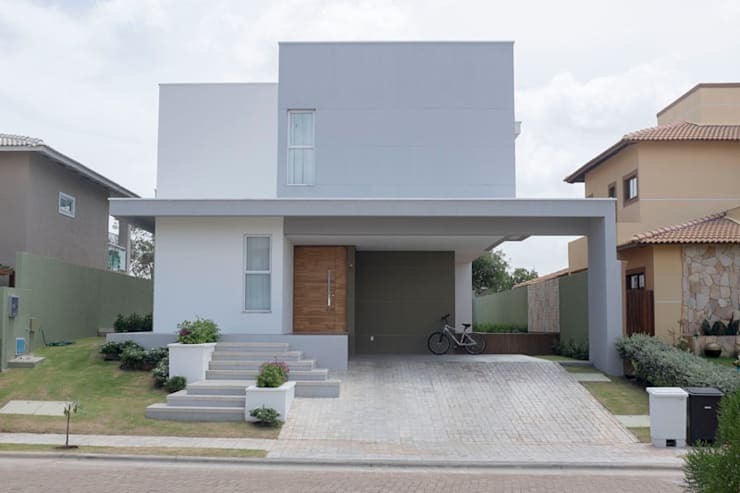 A basic cube shape can be extended to create a really striking horizontally shaped home. This is accentuated with the use of a flat roof. This kind of home shape is often used in resort-style architecture because it has a very grounding and relaxing feel. The visual weight and solidity of a geometric home can be beautifully contrasted with supporting beams and suspended volumes. 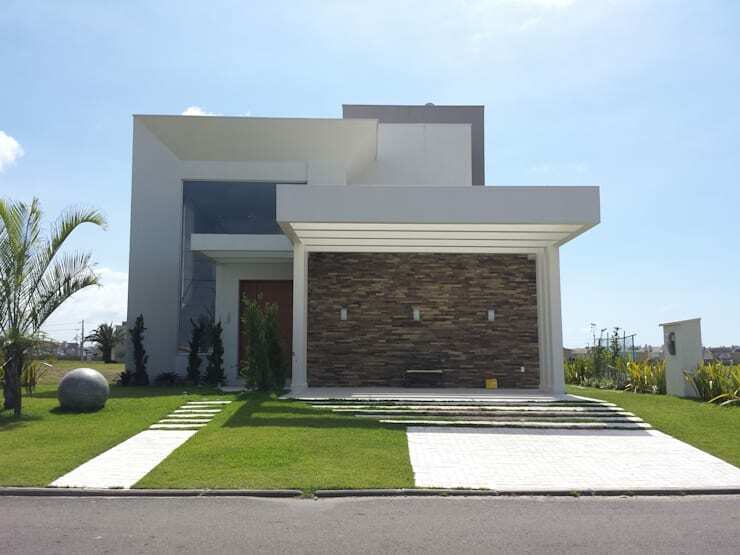 This greatly lightens the feel of a cube-shaped home and gives the facade a very impressive quality. 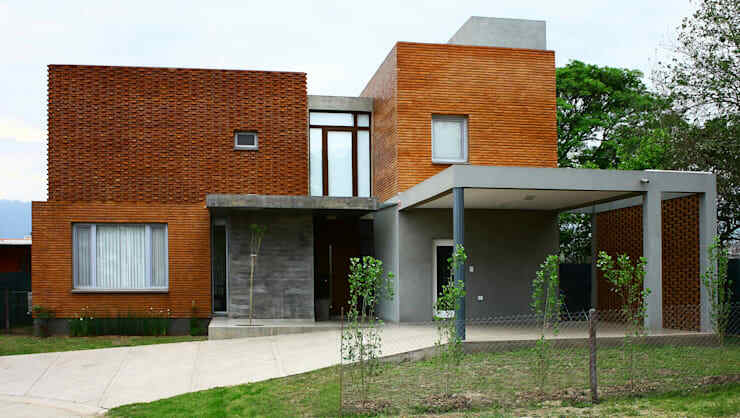 A geometric home facade can be made with an endless variety of shapes and combinations of materials. Note the height of the doorway here and the vertical glass walls on the right. 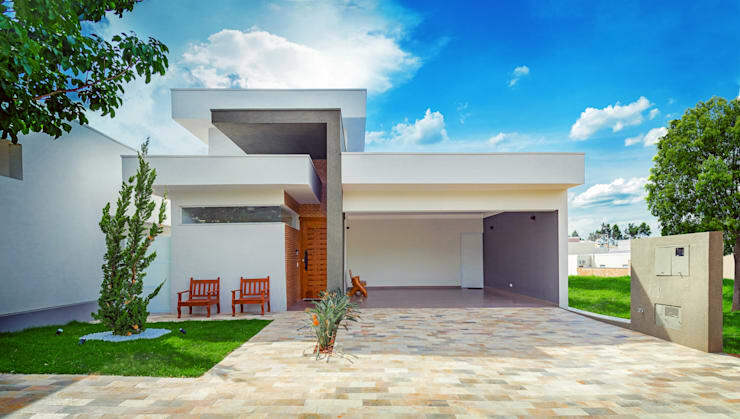 Also, don't forget that the landscaping, pavement and driveway can be used to further unify a geometric design. It's really worth using a professional landscape architect to create this kind of look. Modern cube homes often look best with simple, large windows and doors. 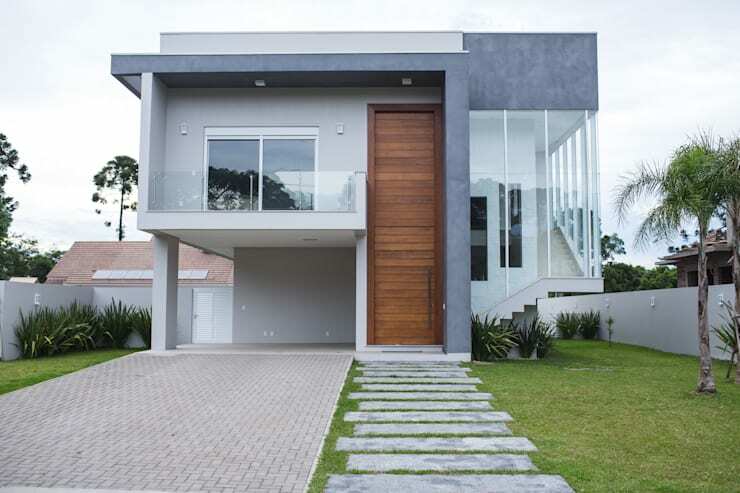 This modern beachside home has large sliding glass doors that give it an appropriate breezy ambience. Modern cube homes may seem simple at first glance, but many of them are surprisingly complex on further inspection. 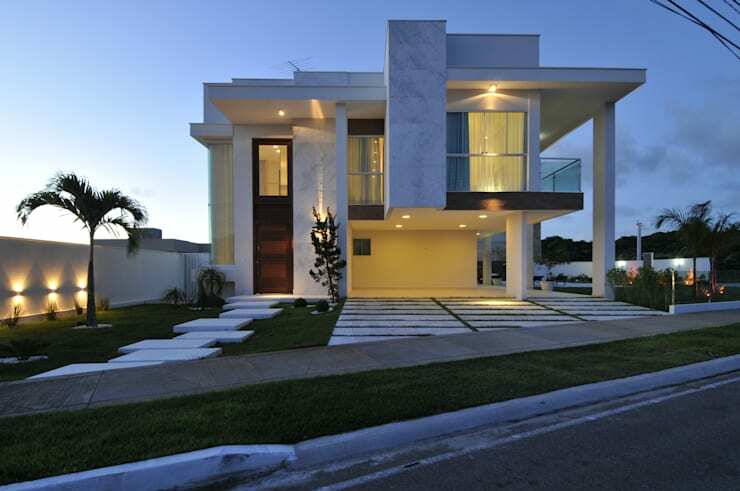 This modern home has an interesting collection of masses that combine to form a stunning facade. Despite the almost total lack of windows, it also feels very welcoming. This is largely due to the great sense of depth in the facade. Note how the entrance is recessed. 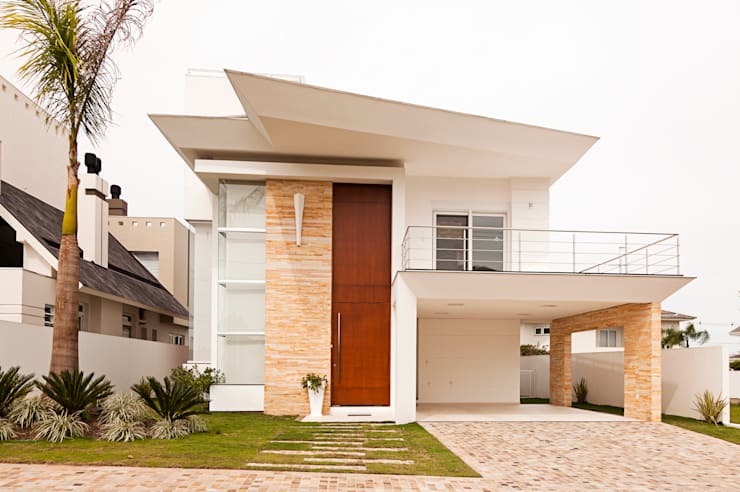 We love the light angled roof on this home. The bold white line creates the perfect contrast against the cube-like mass of the base. 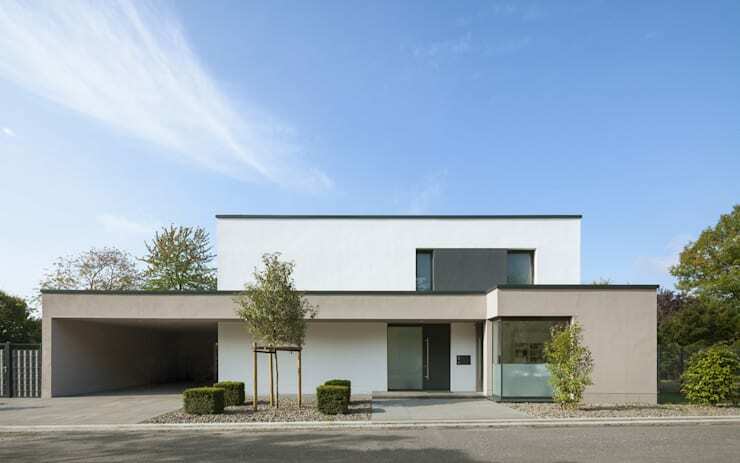 This is also another home that shows the potential for using lots of different materials in the facade. This geometric home has a great deal of contrasts and variety. Note the dramatic contrast between the dark stone walls and concrete beams. The combination of fine and thick shapes also demand attention. Finally, note the shadow pattern on the driveway. Shadow patterns are another element sometimes used to great effect in geometric facades. This lovely red brick home has an upper level that really demands attention. It's composed of three main volumes. On the left, we have a large shape with a really tiny window. The second shape is entirely composed of glass and the third has a more common configuration. This is the perfect home to end our tour. If you're interested in more architectural inspiration, check out 10 single-level homes you'll wish were yours. Which of these contemporary homes is your favourite?